In 1996, the De Schepper family, who already owned Château Tour Baladoz, purchased the neighbouring estate, Château La Croizille (5 hectares) in Saint-Laurent-des-Combes. At first sight, this relatively little-known estate was not especially impressive. However, two years later, the new owners decided to make it into an extraordinary vineyard. Why? Above all, out of respect! First of all, out of respect for nature. It must be said that La Croizille’s terroir – a limestone and molasse outcrop on the Saint-Emilion plateau – is particularly adequate to produce great wine. The south-facing vineyards provide outstanding sun exposure that allows perfect ripening, and the vineyard is planted with a well-adapted blend of premium grape varieties. Making up 70% of this blend, Merlot harmoniously completes the amazing range of aromas and flavours provided by Cabernet Sauvignon (30%). Merlot is fairly easy to grow. This delicate variety does extremely well in the Libourne region. Château La Croizille’s superb terroir is a little gem. Furthermore, the estate borders on such famous estates as Troplong Mondot, La Mondotte, and Tertre Roteboeuf. And also to accept the challenge! A challenge for the young. The young team at Château La Croizille wants to prove that they too can combine nature’s gifts and intelligent winemaking to create something truly special. They are led by Jean-Michel Garcion, Jacques De Schepper’s right hand who has considerable winemaking experience in France and abroad. He is perfectly qualified to accept the challenge and very motivated to do everything necessary to establish this wine’s reputation, focusing on every factor, down to the smallest detail. The vines are being handled with great care throughout the whole growing season. They are closely pruned, grass is left to grow between the vine rows, and the leaves are thinned on the eastern side in June and the western side in September. Furthermore, green harvesting is done so that only 4-5 bunches remain on each vine. Careful sorting takes place at vintage time so that only perfectly ripe, healthy grapes are brought to the vat room. That same consideration is applied during the fermentation to make the most of the grapes’ natural potential, and the wine is put in barrels fairly early on. 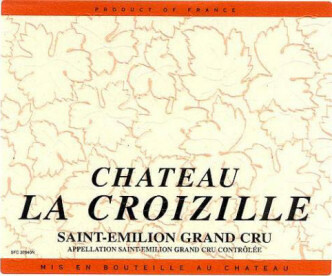 Château La Croizille is aged in 100% new oak for about 18 months. During this period, the wine is tasted and re-tasted to find the exact stage at which the desired structure from oak ageing has been reached. Château La Croizille can thus be said to be the result of a mysterious interaction between genetics, terroir, and human expertise. Every bottle represents an ongoing and tireless search for aesthetic perfection. Consisting of five hectare, Château La Croizille is situated in the heart of Saint-Emilion, in the small town of Saint-Laurent-des-Combes. The vines are on average 35 years and are planted in a soil of chalk and clay. They have excellent sun exposure. Even though both properties are located in the same cadaster, the neighbouring estates Château Tour Baladoz and Château La Croizille have quite some differences in terms of quality. 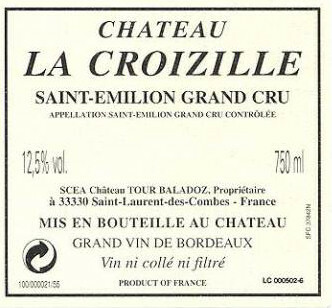 La Croizille, a five-hectare estate, offers many possibilities due to its composition. Certain slopes are south-oriented while the opposite is true for other slopes. The estate has level terraces, six of which are east-oriented. The highest point of the vineyard is seventy metres while the lowest is 30 metres. The soil consists mainly of limestone that still dominates the soil composition at its lowest point, on the plain of Saint-Emilion. Because the bottom covers the rocks of the river, just like in the neighbouring Tour Baladoz, the property disposes of an extraordinary variation ranging from pure limestone to clayey limestone, sometimes only separated from each other by a few metres, and even loam, blue and red clay. It goes without saying that we choose for every type of soil the vine most suited. Out of these differences grows a large diversity of grapes marked by the characteristics that disclose where their origins lie. All year long our team on the field does its utmost to breed and to produce grapes of the highest quality possible. Because we are determined to make a product of the highest quality, we are willing to take our time to produce this wine. Every detail matters, every step is implemented carefully and every decision is considered to be able to create an exceptional wine. Some of our neighbours like La Mondotte, Tertre Roteboeuf, Troplong Mondot and château Pavie have already proven that this region has a soil of outstanding quality. There is not a single detail that escapes our attention. Our presence among the Grand Crus is no coincidence, on the contrary! The grapes that are transported to the cellar are of excellent quality, since they have already been sorted in the vineyard. The harvest is always limited because of the grapes that are left, only between 18 and 25 hectolitres wine is made. The grapes are sorted once again before going into the tanks. The wine-making process consists of guiding, checking and exploiting the enormous potential of the grapes. The after-care begins immediately after the malolactic fermentation in new oak barrels coming from the French interior. In the French department Allier, which is a subdivision of the region Auvergne, where the wood is coming from, forests are layed out for this purpose. The oak trees are carefully selected by our cooper to let them dry in the open air afterwards. After 24 months, the barrel staves are sorted again, the barrels are made, the wood is burnt as we want it and the wine is put in barrels. The wine has then sixteen to twenty months to develop into a class wine and this partly thanks to this material of high quality that is used. After several wine tastings we develop a final blend with one aim only: to give you an extraordinary experience.